TouchMix-30 Control is an app for iPad, iPad mini, iPhone and iPod touch that provides wireless control of QSC TouchMix-30 Pro digital sound reinforcement mixers. The app is not intended to perform any audio mixing or processing tasks on its own. Visit www.qsc.com for more information. 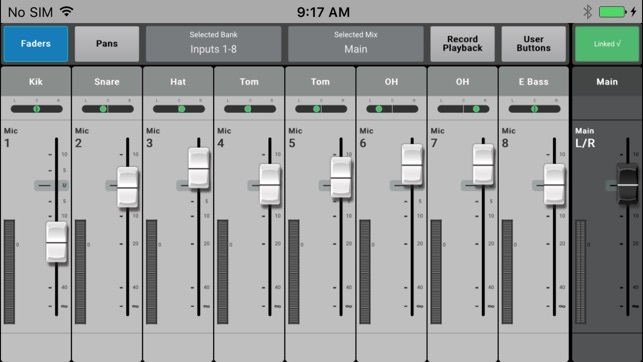 When run on the iPad and iPad mini, the TouchMix-30 Control app closely follows the operational paradigm of the mixer. The iPad and the mixer GUI operate independently so it is possible for the iPad to act as an additional user interface that can display and control a set of functions completely different from those being controlled by the mixer’s screen and hardware. An alternate operation mode – Follow Mixer – is also available. With Follow Mixer engaged, the iPad follows the fader selection on the mixer. Touch a fader on the mixer and the iPad will display that channel’s Overview, EQ, Compressor, Sends or Gate screen. 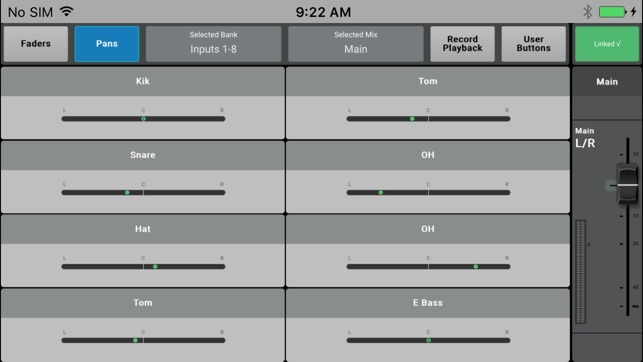 Touch a parameter on the iPad and the mixer’s rotary control will adjust it – or just drag on the iPad screen. 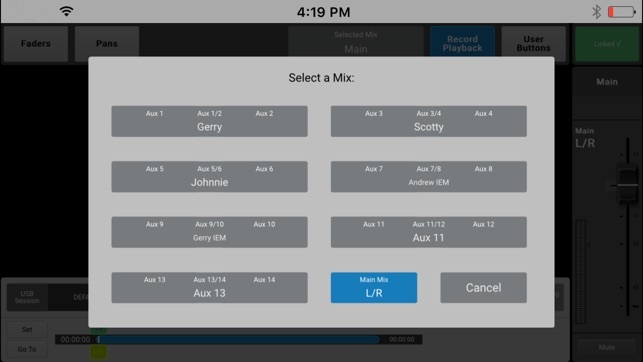 When used without an actual TouchMix, the app acts as a demonstration of the mixer GUI and functionality. On the iPhone and iPod touch, the TouchMix Control app functions as a personal stage monitor mix control with the option to also remotely operate the mixer’s record and playback features as well as programmable user buttons. To prevent inadvertent adjustment of controls, the mixer operator may allow or restrict access to selected functions on a per-device basis. * Includes TouchMix Info system, built-in reference guide. * QSC TouchMix-30 Pro with version 1.2 or higher firmware installed. * QSC TouchMix-30 Pro connected to a Wi-Fi network (recommended). Visit www.qsc.com for more details on Wi-Fi connections. * Note that controlling a mixer with multiple iOS devices running different versions of the app is not recommended. 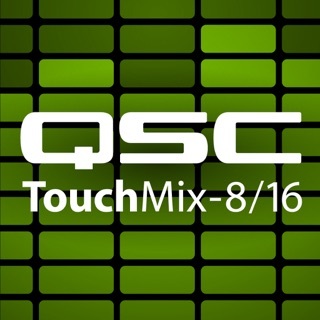 * QSC, LLC Website TouchMix Support Application License Agreement. * This version adds a gain-sharing Automatic Microphone Mixer (AMM). Automatic Microphone Mixers are most commonly used for speech applications such as conferences, presentations or panel discussions in which there are multiple talkers and multiple microphones. An Auto Mixer will reduce feedback and minimize extraneous noise (such as paper rustling from panelists or HVAC) by allocating gain to microphone channels with active talkers while reducing the gain of unused channels. The TouchMix-30 Automatic Microphone Mixer (Auto Mixer) is a gain sharing design that is available for all 24 mic/line input channels. I bought this to operate a sub mix for a monitor from my iPad. However, after downloading it doesn’t want to trust the WiFi connection. Then it asks for multiple firmware updates. The updates appear to be needed on my iPad. What??? My operating system is up to date and I have to he latest version from the App Store. Really needed this app to work with my churchs' TouchMix-30. It doesn't pick up any type of signal from the mixer at all. This app in conclusion is worthless at this point. Please take a look into this.